The last two posts have played a game of find the electrons. We saw how the dyotropic rearrangement of ethane borrowed electrons from the C-C bond, and how 1,2,dibromoethane went ionic on us. How about this mixed system, in which a hydrogen and a BH2 swap their positions? Dyotropic rearrangement involving boron and hydrogen. It is yet again different. 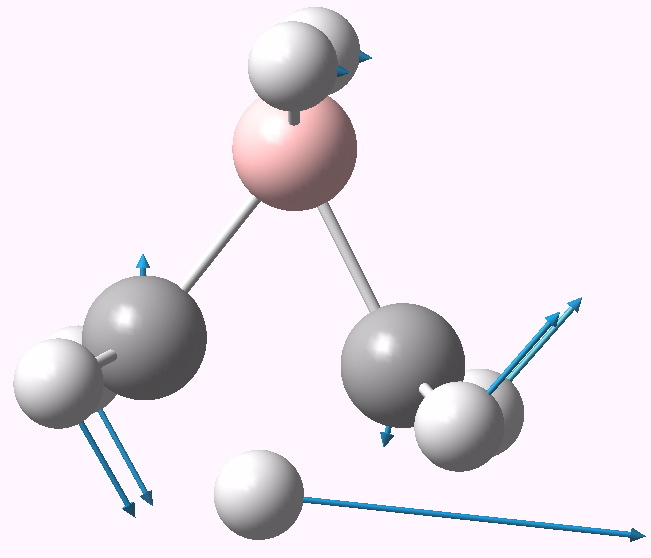 Unlike the ethane system, this C2v-symmetric system is a true transition state, with no other distorsions. The C-C distance is an unusual 1.729Å, whilst the C-B distances are a more normal 1.61Å. Transition state for H/BH2 transposition. Click for 3D. Intrinsic reaction coordinate for the dyotropic rearrangement. The ELF partitioning shows 1.81 electrons in C-B disynaptic basins (red, below), and 1.91 electrons in a trisynaptic C-H-C basin (yellow, below), or 5.53 in total. No discrete C-C basin is found, and no evidence either of ionicity as with dibromoethane. 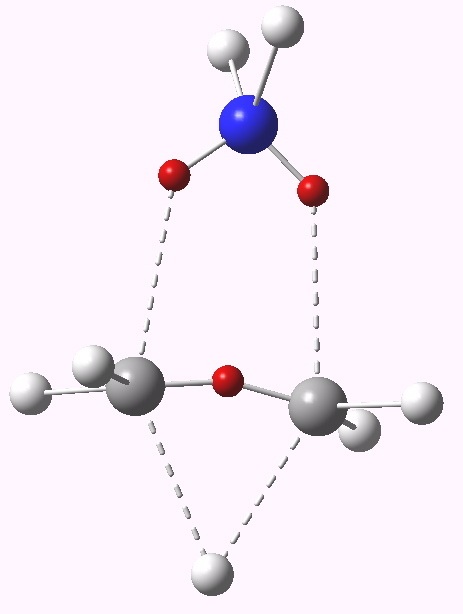 Finally, adding two electrons into the system, as with NH2 replacing BH2, produces a similar result but now with the C…C region populated with 2.22 electrons (the surprise is that this extra electron pair is NOT associated with the nitrogen). 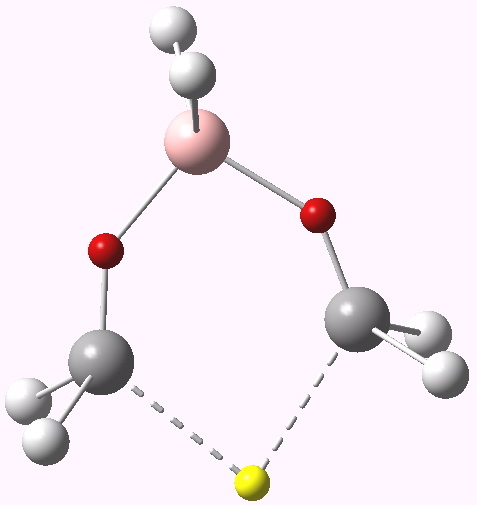 These extra electrons reduces the C-C bond length to 1.395Å. ELF analysis for NH2/H transposition. What an adventure. 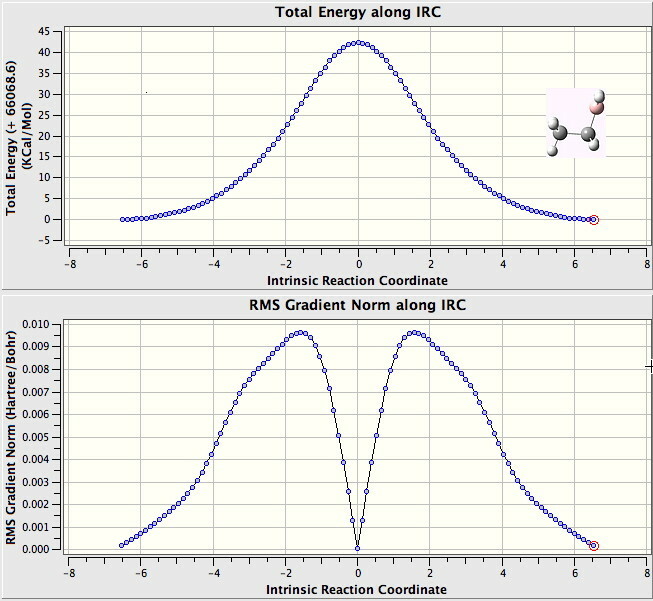 It reminds us never to take for granted where the electrons are in a molecule (or the transition states for its reactions), although to be fair we can normally guess pretty well. This entry was posted on Sunday, June 12th, 2011 at 3:12 pm and is filed under Uncategorized. You can follow any responses to this entry through the RSS 2.0 feed. You can leave a response, or trackback from your own site. Buses (and dyotropic rearrangements) always come in threes. is licensed by Henry Rzepa under a Creative Commons Attribution-Noncommercial-Share Alike 3.0 United States License.